The Baxter Springs tornado recovery site is now ready for and welcoming VIM Teams to help with repairs and rebuilding in those communities. So many of you have conveyed your willingness to assist and we thank you! Pastor Max Raney recently came onboard as the Construction Coordinator and has literally hit the ground running. Max is a former Building Trades Instructor at Franklin Technical School and you will appreciate his abilities, amiable personality and his "all for the glory of the Kingdom" attitude. In this small community it is safe to say most everyone was directly or indirectly impacted by the April 27th storm. However, only a small percentage of owner-occupied homes sustained some extent of damage and we anticipate the repairs and rebuilding should go fairly quickly. The work starts next week as Holton UMC comes in, followed by Tisdale UMC so please respond now because yes, your help is most certainly needed. The majority of the exterior work will include roof tear-off and replacement, window replacement, siding repairs, partial replacement and facia and soffit repair and replacement. There will also be siding to scrape and paint, yard work and tree trimming. We encourage volunteers to bring whatever tools you can comfortably pack. Once you're scheduled, site leads will be in touch to outline your scope of work. There are a couple of nearby churches that have offered to house volunteer teams and more information on scheduling your team, contact the site managers, Lin Harris, at 918-607-5125 or umc.dr.baxter@greatplainsumc.org. God bless you for expressing an interest in making these sites your mission field! Clean-up is completed and we thank everyone who graciously gave of their time to work at the Multiple Agency Resource Center, helping distribute UMCOR supplies, support in the office and helping clean up the debris and destruction. The local community is now working to form a long term recovery committee and assessing the unmet needs caused by the storm. The LTRC will be leading case management and submitting projects to our Disaster Recovery leader Lin Harris so when those projects get underway there will be a second round of appeals for volunteers to help with the repairs and rebuilding efforts. In less than two weeks much has been accomplished in Baxter Springs, Kan., following the April 27, 2014 tornado. The damage to homes and businesses was significant, leaving behind a wake of debris and chaos. The Relief Phase of this disaster is quickly ramping down with destroyed homes being demolished, debris hauled off, roofs tarped, and people finding temporary places to live. UMC Volunteers have been wonderful and have helped meet with survivors to learn about their needs at the Multiple Agency Resource Center held in the high school, hand out UMCOR blankets, bedding kits, health kits, school and layette kits, tarps and gift cards, plus help with setting up an office, finding furniture, bringing in the shower and tool trailers, and debris clean-up in the community. Plans are now underway for the long-term recovery phase, a time when case management is done to help survivors find the needed funds to repair and rebuild their homes. On May 6th, just 10 days after the tornado, Rev. Wayne Handle, pastor of Baxter Springs First United Methodist Church, and other leaders organized an initial meeting at the church to discuss the need for leaders in the Baxter Springs community to form a long-term recovery committee. This group will become a coalition of churches, nonprofits, businesses, and civic organizations, to coordinate benefits and volunteers to help survivors. As Great Plains United Methodists, we will be a part of that coalition and will continue to share in the leadership, providing spiritual and emotional care, financial support, and volunteers who will help rebuild and repair. At this time are seeking funding and volunteers who will work in the office at least a day a week, assist with case management, assess how and what is needed to repair a home, and coordinate volunteers. To learn more about these volunteer opportunities, contact the United Methodist Disaster Recovery Center in Baxter Springs at 316-641-9549 or umc.dr.baxter@greatplainsumc.org. PHOTO: Volunteers meet at the Baxter Springs Disaster Recovery Office to get instructions on their next project and to hand out supplies to tornado survivors. Shown in the photo from left to right: Kay Smith from Holton Evangel UMC, Ray Hefley from Baxter Springs 1st UMC, Carl Carlson from St. Paul’s UMC in Joplin, MO, and Robilea Swindell from First UMC in Lawrence, KS. Lin Harris has joined the disaster response as staff in Baxter Springs as the site manager. Harris will be responsible for leading and coordinating the long-term recovery phase, recruiting, engaging and equipping volunteers to help with case management, construction and assisting with office work. Harris brings considerable disaster response ministry experience to the position, having led volunteer coordination for the United Methodist disaster response efforts in Joplin, Mo. She will office at First United Methodist Church, Baxter Springs, and can be reached by cell at 316-641-9549 or email at umc.dr.baxter@greatplainsumc.org. 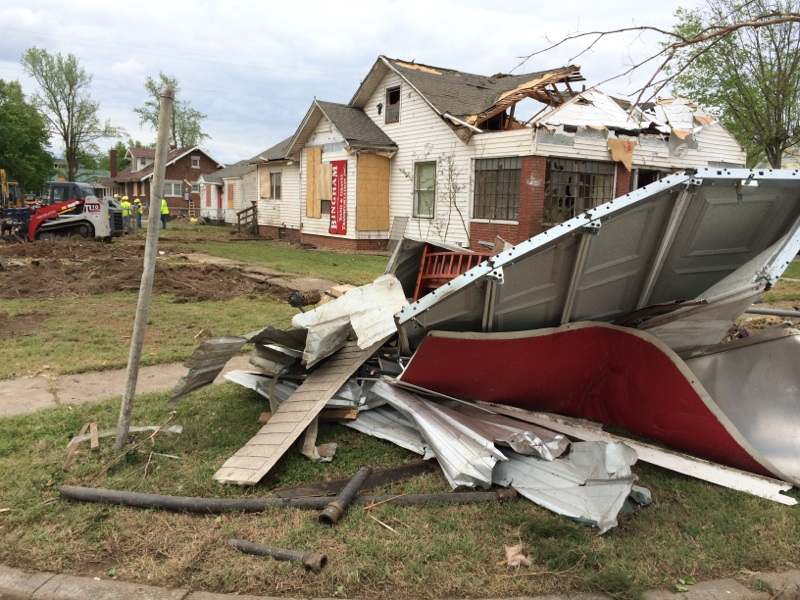 There is an urgent need for volunteer case managers and office help; please contact Harris to get involved as together United Methodists offer tangible hope to the people in Baxter Springs as they continue repairing and rebuilding their lives. The Federal Emergency Management Agency (FEMA) has determined the victims of the Baxter Springs tornado will not be eligible for federal individual assistance. FEMA assesses a number of factors to determine the severity, magnitude and impact of a disaster event. Gov. Sam Brownback declared a state of disaster emergency, an act which indicates recovery is beyond the resources of the local government. FEMA has declared that the Baxter Springs disaster does not meet their guidelines for federal supplemental aid. The State of Kansas will make Small Business Administration low-interest loans available, however no grants or other funds have been offered for individual assistance. Without FEMA assistance, the City of Baxter Springs must scramble to develop a plan for debris removal that will enable their business district to function and bring relief to their citizens. Bishop Scott Jones is issuing a conference-wide appeal for contributions to the disaster response fund. This video is available to download. All Great Plains United Methodist churches are encouraged to share this video with their congregations during upcoming worship services. Give through your local church offering plate to the conference disaster response fund, with the number 975 in the memo line, or donate online. Funds are used to help in times of disaster across the Great Plains Conference. As the most populous city of Cherokee County, Baxter Springs serves as the economic hub. The damage to the city’s business district and the cost of recovery will be felt across the county. 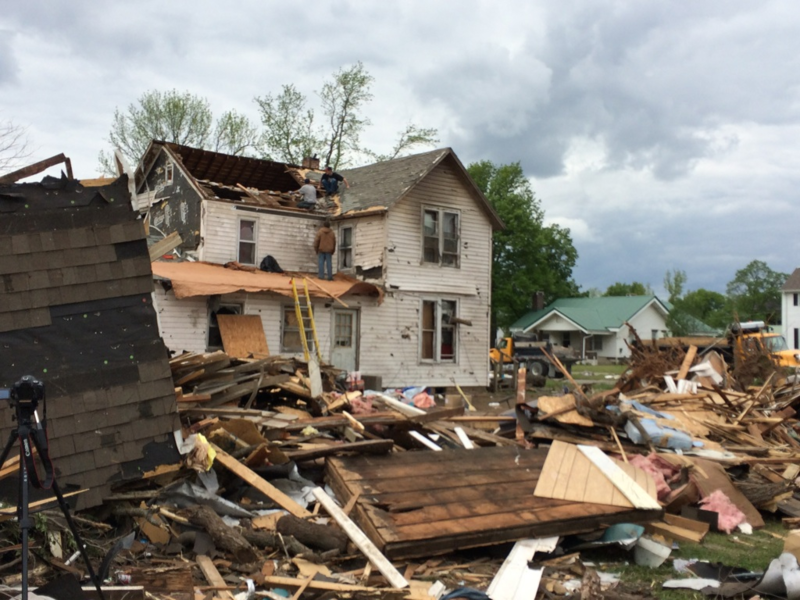 The Kansas Division of Emergency Management reports at least 91 homes and 11 businesses were destroyed by the tornado now rated by the National Weather Service as an EF2 on the enhanced Fujita scale. At least seven other businesses and 85 homes suffered damage. As of 2008-2012, the per capita income of Baxter Springs is $18,329, which is lower than the state average of $26,845. At least 18 percent of the population is in poverty, which is higher than the state average of 13 percent. 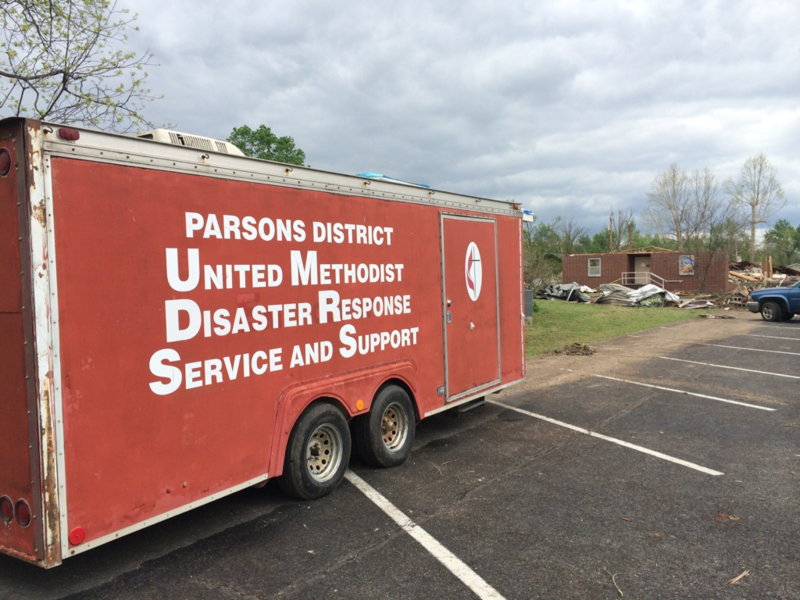 The Great Plains Disaster Response team has established a United Methodist Church Disaster Recovery Center at the First UMC, 1310 East Avenue, in Baxter Springs. The phone number is 316-641-9549. The Great Plains Disaster Response in Baxter Springs is led by Russell Anderson, the regional disaster response coordinator. Coordination of recovery efforts continues as the first Early Response Team (ERT) started doing intake at the Multiple Agencies Resource Center (MARC) today. The MARC will be open through Sunday, but the UMC Disaster Recovery Center will function long-term and needs volunteers to coordinate the work, help with construction, and conduct case management. If you are interested in helping as a long-term volunteer, call the center at 316-641-9549. All trained early responders are needed immediately for clean-up and recovery. Those interested must make lodging arrangements in motels in towns near Baxter Springs or they can stay at the Baxter Springs UMC if they bring enough supplies to be totally self-sufficient. Area churches are donating some supplies to help volunteers. A shower trailer will arrive Saturday. UMCOR is delivering disaster-relief kits today as well as tarps, bedding kits, health kits, school kits, layette kits and prayer books. In addition to sending an ERT, Church of the Resurrection has donated gas cards and Walmart gift cards to assist tornado victims with recovery. For more information on the tornado damage and the Great Plains United Methodist response, see the previous news story.